I was tagged by my friend Paisano for a photo meme. Here’s how it works: You go to your Flickr.com photostream (don’t have one? Sign up! It’s free, and Flickr has a great community and fun groups! ), go to the 6th page, find the 6th photo, and post it. Here’s my 6th page’s 6th photo. I’m the Community Manager for the elementary school’s PTO, so I take a lot of pictures! 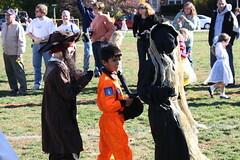 Every year, the school has a costume parade at Halloween. It’s so fun! There is fierce competition for the funniest costume, the most original, etc. The kids really get into it. There isn’t one kid in the school that doesn’t dress up, and it’s a huge school. Next post: Entry on Geeks! Previous post: Unfortunately talent doesn’t inherit up.